Intercax has released Syndeia 3.2, a major advance in “breaking the silos”, that is, breaking down the barriers between domain engineering tools and their users to make complex systems development faster and more efficient. We talk about MBE (Model-Based Engineering) rather than MBSE (Model-Based Systems Engineering) which can too easily become one more silo in the engineering process. The MBE platform shall create and maintain a Single, Digital Model of the System extending over many tools and repositories, from many vendors (Figure 1). 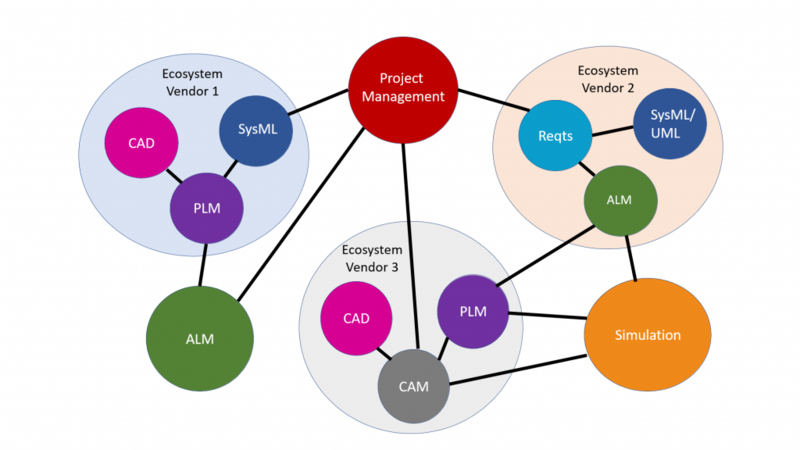 No single tool or model is indispensable to the Total System Model (TSM), not SysML or PLM or any other, though any or many of these may become hubs. The MBE platform will be an Enterprise Application, scalable to the largest projects and accessible to everyone on the project team. In Syndeia version 3.2, we introduce Syndeia Cloud, a critical step on the path to meeting these requirements. In version 3.1, Syndeia existed only as a plug-in for MagicDraw or Rhapsody. While it allowed users to store inter-model connections on an external database, most of the functionality resided on the local plug-in. In Syndeia 3.2, all of the information created by Syndeia, such as the inter-model relations between the artifacts from different repositories (e.g. PLM, ALM), is now managed and version controlled on Syndeia Cloud, and accessible via a standard REST API. 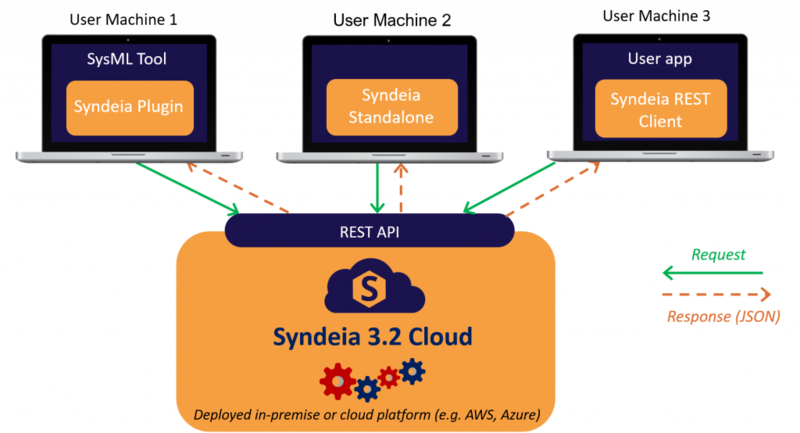 Syndeia Cloud services become available not just to SysML plug-ins, but also to a new stand-alone Syndeia client, part of the new 3.2 release, or to user-written applications calling the open REST API. In Figure 2, we illustrate some of the possible ways of accessing the Syndeia data tying the TSM together. The introduction of Syndeia Cloud opens up some new possibilities for MBE practitioners, starting with Syndeia 3.2. Parts 2 and 3 of this blog series will describe direct non-SysML reference connections and the Syndeia Standalone Client, respectively. Part 4 will cover another new feature, the ability to create custom user-defined mappings in model transform operations. Part 5 will be an overview of new capabilities in existing tool interfaces in Syndeia 3.2, especially for the Simulink/Stateflow model transforms.